I had a few beers yesterday, to celebrate completing my first organised 5K run! 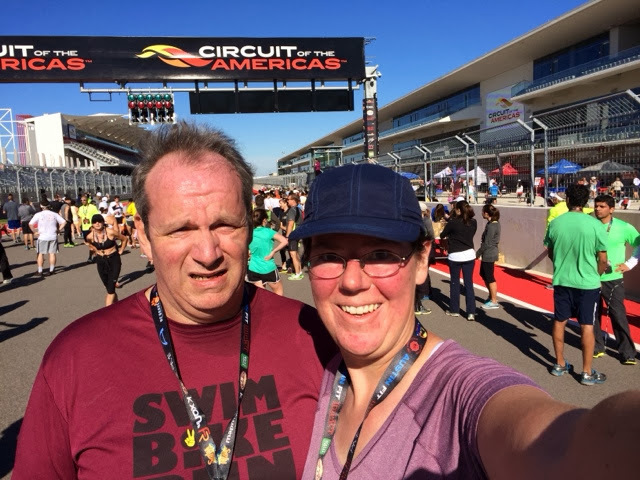 Alan and I went to the Circuit of the Americas for the 'Formula Run' event, which involves running a lap of the track, ahead of the F1 race in two weeks' time. I really wanted to run this lap. 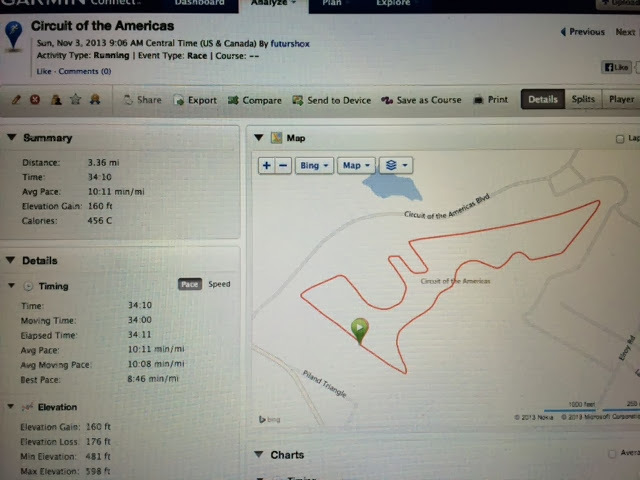 Wind the clock back to this time last year, and it's no exaggeration to say that I could barely walk, never mind run. I was struck with some bad sciatica which took several months, many chiropractor visits and time in the gym to heal. Alan made me join the gym classes at his work and it's probably one of the best things he has ever done for me. We do a mixture of cardio, weight training and core work in these classes. Some days we run as part of the warmup, and one day something clicked, and I figured I could maybe run a little bit around the neighbourhood. 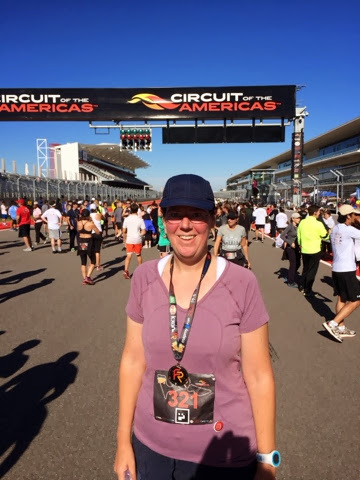 One thing led to another and soon I put a Couch-to-5K app on my phone; it told me when to run and when to walk, increasing the run time and distance over eight weeks. 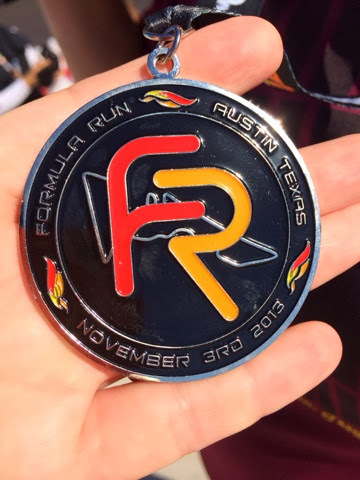 I finished that training about 10 days ago, running my first 5K. Two more of those and it was time for the lap of the track! Here's the view from the starting line. Yes, that's a steep hill up into Turn 1. Notorious, whichever method of transportation you're using to get around it. The drop down to Turn 2 is almost as hard; trying not to run out of control down the other side of that steep hill. 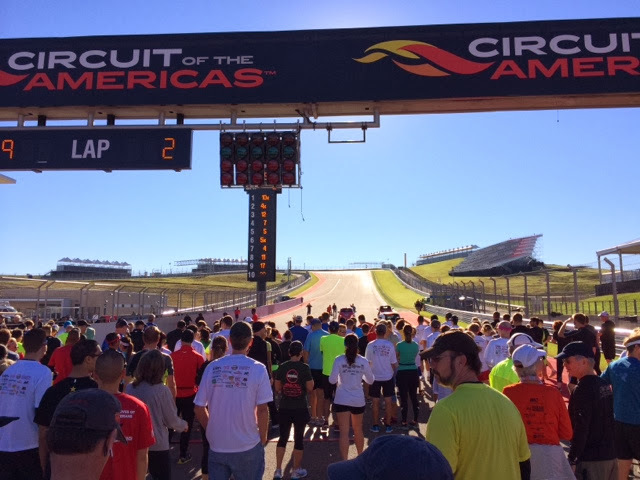 Running around the track was cool; no photos since I was busy running, but it was interesting getting to see the track from a competitor's point of view. I may or may not have uttered the odd 'zoom' or 'screech' around certain corners ;-) The drag up to turns 7 and 8 is a long slow hill. Alan said it's harder on a bicycle (he rode around here a few months ago) but I was happy to find it wasn't as bad as I'd feared, running up it. Drop down again into the hairpin, then some gentle undulation along the straight before running into the turns in front of the main grandstands. There's a gentle hill, then back down, then up again as you come around the base of the Tower, before continuing around to the pit lane entrance; run past there into the left hander that takes you back to the start/finish straight. The 5K mark is at this corner; it's actually 5.4K for a complete lap, so run a bit more to the finish line. Yay! 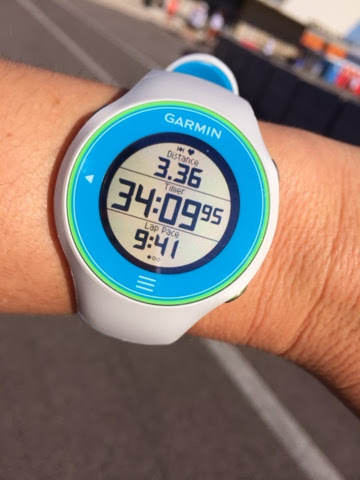 This is my Garmin GPS watch; it tells me I ran 3.36 miles (the track is 3.4 miles along the middle, but we took the racing lines) in 34 minutes and 9 seconds. My official time was 34.12 I think; but they time it from when the gun goes off, so if you're not right at the very front then you'll have a few extra seconds here.